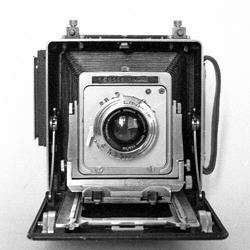 After a long time of thinking about buying into Large Format, I finally found the camera I wanted to have, an old press camera. Graflex seems to be more expensive and with less movements so I bought an this old, ugly, beaten up and modified Busch Pressman. Well, more movements and the modification was to allow for movements of the back which can actually be very usefull at time. Being a press camera, you would think it's easy to operate hand held, well, it is possible but it's not easy. The thing is very heavy so it should really be used on a tripod for best results. Taking lens : any large format lens mounted in a shutter on a Busch Pressman panel. 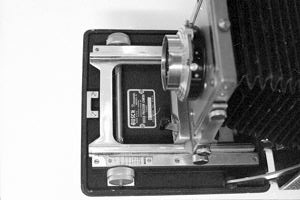 Back : standard back for use with standard large format sheet film holders. Negative Size : 4x5" or smaller such as 6x9cm. Modifications : my camera was modified to allow for back tilts. A first impression on the Busch Pressman 4x5 Model D.
Camera description of a great, real mint, Model D.
Free camera manuals of Models C and D.